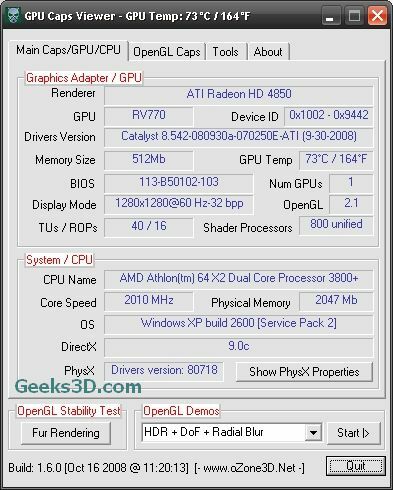 GPU Caps Viewer has been updated with ForceWare 178.24 and Catalyst 8.10. Driver detection has been improved and Geometry Instancing as well as Vertex Displacement Mapping OpenGL demos now support ATI Radeon graphics cards. New: button in first tab to display PhysX control panel. New: graphics hardware detection code is now done by the ZoomGPU engine. 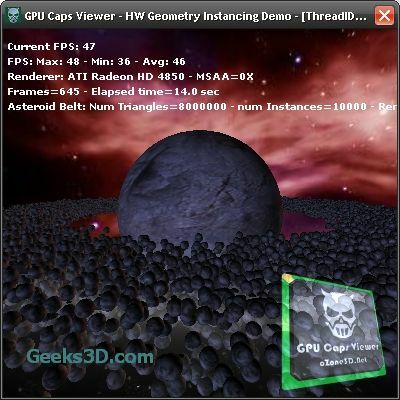 Change: Geometry Instancing support detection for ATI Radeon graphics cards (read more HERE). Now with Catalyst 8.11 the geometry instancing demo works fine on Radeon. Change: added ForceWare 178.24 and Catalyst 8.10 to database. Bugfix: in driver version detection.